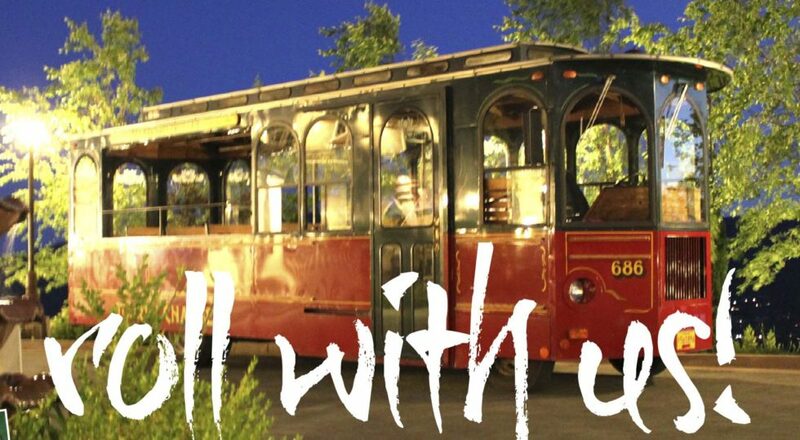 This upcoming First Friday, March 3, ride the Allaboard Trolley to visit downtown galleries and the art happenings at Southern Oregon University. Exhibitions can be viewed in the Schneider Museum of Art Museum, the Center for the Visual Arts (CVA) Galleries, and the Fine Art students’ Private Open Studios until 8:00 PM. The Museum is hosting a book reading by local author Michael Niemann at 5:00 PM. University parking behind the Museum will be made available to the public starting at 4:00 PM. The Allaboard Trolley will shuttle patrons to and from the Museum to the downtown Ashland area between 5:00 PM and 10:00 PM – a generous amount of time to visit the Museum, the student studios and Center for the Visual Arts (CVA) Galleries, and then visit your favorite Ashland galleries, studios, restaurants and more. There will be three stops on the Trolley route, the Schneider Museum of Art, A Street between 5th and 6th Streets, and the Plaza by the Fountains. Wine will be generously poured within the Museum and the hours will be extended until 8:00 PM. At 5:00 PM, local author Michael Niemann will read from his latest thriller, Illicit Trade. Niemann grew up in a small town in Germany, seven miles from the Dutch border. Crossing that border often at a young age sparked in him a curiosity about the larger world. He studied political science at the Rheinische Friedrich-Wilhelms Universität and international studies at the University of Denver. During his academic career, he focused on Southern Africa and frequently spent time in the region. After taking fiction writing courses from his colleagues at Trinity College, he embarked on a different way to write about the world. He currently teaches in the International Studies Program at SOU. On view at the Schneider Museum of Art is Shapes of Curiosity, the SOU Creative Arts Faculty Exhibition curated by Kelly Worman to complement the Southern Oregon University Center for the Humanities 2016-2017 Campus Theme. Featured Southern Oregon University Creative Arts faculty artists include: David Bithell, Cody Bustamante, Garrick Imatani, Miles Inada, Kyle Peets, Max Reinhardt, Margaret L. Sjogren, Robin Strangfeld, and Summer Ventis. For more information, please contact the Museum at 541-552-6245 or visit the website at sma.sou.edu. For information about the Center for the Visual Arts galleries, please contact cvagalleries@sou.edu or visit Facebook.com/CvaGalleries.